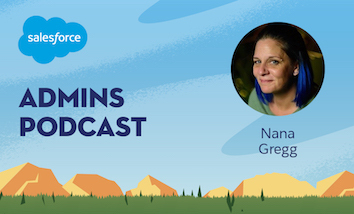 Today on the Salesforce Admins Podcast we’ve got Nana Gregg, VP Senior Salesforce Administrator at JLL Technology Solutions and Salesforce MVP. 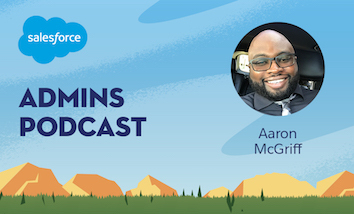 She’s the second person featured in our Behind the Customer Stories series for the Admin Keynote at Dreamforce. 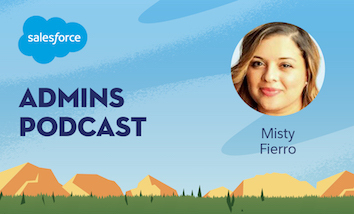 We’ll find out how she uses Salesforce to drive innovation in every part of her org. Join us as we talk about how her passion for learning grew her career, how she gets other members of her company to see her as more than an IT resource, and the power of community. You should subscribe for the full episode, but here are a few takeaways from our conversation with Nana Gregg. Have you heard of this thing called Salesforce? Nana’s origin story is going to sound familiar to longtime listeners of the pod. “I had started out at a company as an executive assistant and transitioned to several positions over the years. One day they came to me and said, ‘Hey, we’re about to start using this software called Salesforce for our marketing and we want to put you in charge of it, so here you go,’” Nana says. She was soon off to an Admin class and the rest is history. “I fell in love with Salesforce really quickly,” Nana says, “the ability to own the org and work with the different business users to identify their processes and see what we can do to make things useful for them.” For her, the platform was exciting because it allowed her to engage with all sorts of new problems in every area of the organization. How Nana worked her way up to VP without a college degree. “I don’t have a college degree,” Nana says, “but I think one thing that has got me here has been a hunger to learn and a hunger to do the best that I can for the company that I’m working for, and for the community as a whole.” That serves her well in her current role because at JLL the Salesforce team is really the backbone of the organization. They need to know a little something about everything: marketing sales, service processes, project management, finance, and more, in order to make those systems work together. One of the things that Nana’s team has built is a cost allocation process with flows. If someone logs time for a business unit that’s not their own they need to transfer costs, with variations based on what country they’re living in. This process was always done manually with spreadsheets, but Nana sat down with the finance team to understand what evaluations they were making. They were able to automate the process to create cost allocation records that can be turned immediately into journal transactions. 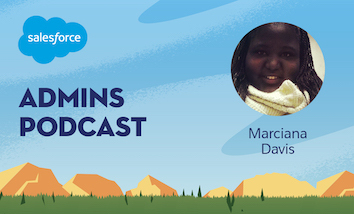 “I never knew that when I became a Salesforce Admin I would need to learn finance, but I did,” Nana says. “I learned finance concepts and accounting concepts because I had to implement this AppExchange package, and that has made me a better administrator because I can talk to those teams and understand what they’re asking me to do.” These days, Nana and her team have taken to calling themselves “Flownatics” because it seems like they can solve almost anything with a flow. Nana’s process for prepping for new releases. When it comes to new releases, Nana’s process is evolving. “Up until about two releases ago I still printed them out,” she says, but now she works digitally. The first thing she does when a new release comes out is to hit the highlights: she looks at the major areas of focus that they use in their org. Within the first week, she sends an email to her boss breaking down the changes by how easy they are to implement. There are the things they can just make happen without affecting end users, but there are also the things that need a process around them if they want to use them. “What I want is to get the newest release over a weekend so by morning I can come in and send an email with all the cool new functionality,” Nana says. She wants people to get excited and stay excited about the system by seeing that the Admin team is constantly innovating and improving things for their users. She even got her boss to start doing Trailhead and he’s become a Lightning advocate for their organization. Why you get when you give in the Salesforce Ohana. Join us for the Salesforce Admins Keynote at Dreamforce! Attend a Global Gathering near you! Gillian Bruce is a Principal Admin Evangelist. Since joining Salesforce in 2010, Gillian’s been a champion for driving system administrators’ success in several roles. She loves the Salesforce community, her hometown of San Francisco, and is part mermaid. New Salesforce Admins website coming soon!